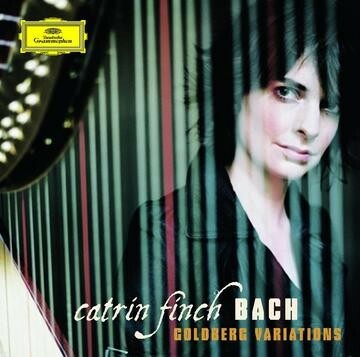 Anyone who has witnessed Catrin Finch at Spoleto in recent years, particularly her assault on Bachs mightiest Toccata and Fugue, will not be surprised that the Royal Harpist to the Prince of Wales has been emboldened to transcribe the Goldberg Variations to the most cumbersome, effeminate instrument in the orchestra. She can do as she wills, and here proves herself more than merely the Segovia of the harp, a label affixed to a harp wizard of a previous generation. Finch takes herself beyond the self-accompanying wonders that have been achieved on harp and guitar, invading the contrapuntal domain of the harpsichord and piano. For the most part, Finch holds her own when measured against the great piano exponents of the Goldbergs. If Glenn Gould softened the music on piano, retaining some of the harpsichords crispness and clarity of line, then its useful to describe Finch as taking the romantic polish of Daniel Barenboims performance and shining it even more brightly on her more ethereal harp, restoring some of Goulds baroque freshness simply by not taking so lugubriously long about it. In doing so, she stands closest to the middle ground of Murray Perahia. Listeners familiar with the Goldbergs will instantly be gladdened by the faithfulness of Finchs transcription. In a booklet graced with a blurb from Prince Charles, there is an extensive interview with Michael Church, where Finch admits that it took her a year to make her adaptation of the most chromatically challenging Variation, the 25th  and that she finally had to settle for a compromise with the 11th. On the other hand, Finch claims that Variation 7 works better on harp than the piano and points to the Variations in the minor mode  15, 21, and 25  with similar pride. Finch quickly proves her credibility with her dexterous gallop through Variation 1, yielding nothing in speed to the great piano versions. Listeners may be as taken aback by the effect of the harps ethereal resonance as they are with the soloists ability to execute all those trills, clusters, counterpoints, and phrasings that are the keyboards birthright. Confidence is restored with the mid-tempo rendition of Variation 2, and a fresh surprise awaits in Variation 3: the resonating baseline underneath the dulcet treble actually sounds like a pipe organ. Skip ahead to the Variation 10 Fughetta to hear the most impressive example of Finchs contrapuntal mastery. Variation 14, perhaps the most idiosyncratic of all, is attacked with a jubilant glee that makes Perahia sound cold by comparison. Variation 20 has more uptempo dazzle, but its Variation 28, up in the treble stratosphere, where Finchs artistry is perhaps most convincing. Here the music sounds as if it belongs to the harp. For a brief moment, its the keyboard version that is hard to imagine. Queen of harps? That label has already been affixed to Finch. Deservedly.